Vatican's newly appointed Secretary of State Monsignor Pietro Parolin speaks during an interview with Reuters TV in Caracas, Venezuela, on Sept. 4. The Vatican’s second-in-command set off speculation this week about the future of priestly celibacy in the Catholic Church when he said the institution is open to discussion – but it hasn’t always been the case that priests were not allowed to marry, experts said, and the discussion is hardly new. 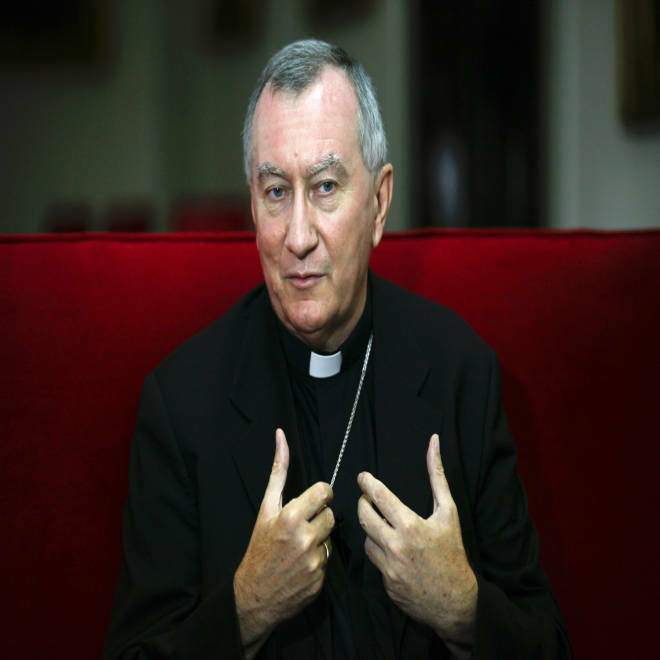 Nevertheless, the remarks by Archbishop Pietro Parolin, the Holy See's secretary of state, that “efforts that the church made to keep ecclesiastical celibacy ... have to be taken into consideration” will likely cause many of the religion’s faithful to sit up in the pews. And the seemingly off-hand remarks may have been a well-placed trial balloon by the church on the topic. A candid discussion about the requirement that priests remain chaste would be welcome in the United States, where about 30,000 former priests have left because they wanted to pursue a relationship, said Thomas Groome, a professor of theology at Boston College. And while many Catholics today just assume that priests have always vowed to stayed wedded only to the church for life, the idea of complete celibacy among the clergy only started to become standard practice in the 11th, 12th, and 13th centuries, Groome said — and still never caught on fully in some parts of the world. “As far as we can tell from the Gospels, all of the apostles were married, with the possible exception of John,” said Groome, noting that the Orthodox Church has always had a married priesthood, he said. But over time, a celibate priesthood became the rule in the Roman Catholic world. While that may be the letter of church law, celibacy is seen differently by many Catholics as they practice their faith in schools, parishes, and homes. And the Catholic Church has seen a significant decline in its number of priests over the last 50 years, dropping from almost 60,000 in 1965 down to 39,600 in 2013, according to the Center for Applied Research in the Apostate. “In truth, Parolin’s comments represent what might be termed the moderate Catholic line – priestly celibacy is a discipline, not a dogma, and can therefore be revised," wrote John L. Allen, Jr., senior correspondent for the National Catholic Reporter. "But it nonetheless has value, and the church is not a democracy but it can and should be more collegial." Yet the possibility of a new conversation about whether priests must remain celibate would also receive a welcome in Ireland, according to Father Brendan Hoban, a spokesman for the Association of Catholic Priests in Ireland. And George Weigel, who analyzes Vatican affairs for NBC News, notes that there has always been room for debate on the delicate issue of celibacy. “That celibacy is disciplinary, not doctrinal, is obvious from the fact that there are married priests in the eastern Catholic Church, like the Ukrainian Greek Catholic Church,” Weigel said. And discussions about the issue of celibacy go on within the church “all the time,” he said. Pope Francis, who has been widely heralded for embracing a simpler lifestyle and dogma since he was elected to the papacy, spoke in a 2012 interview for the Spanish-language book “On the Heavens and the Earth” about his own experience of the celibate life. “In Western Catholicism, some organizations are pushing for more discussion about the issue. For now, the discipline of celibacy stands firm. Some say, with a certain pragmatism, that we are losing manpower,” then-Cardinal Jorge Bergoglio said in the interview, which was translated by the Catholic news site Aleteia. For Groome, it seems unlikely that Parolin would have brought up the issue if he did not have some sense that Pope Francis would be onboard. “I imagine Parolin at least knows Francis is open to the conversation, or he wouldn’t go out on a limb and say it,” Groome said. NBC News’ Tracy Connor, Annabel Roberts, F. Brinley Bruton, and Petra Cahill contributed to this report.